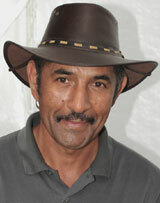 Fulllgrain leather hat with broad curved brim, flyband and chinstrip. 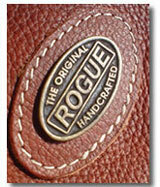 The ultimate Rogue leather hat. Fullgrain Rogue leather broad-brim Explorer hat with genuine Nile Crocodile hat band. The original suede and mesh outdoor hat. Broad brim, ventilated sides with flyband trim. Fullgrain pull-up leather Rogue classic with medium brim and plaited hatband. 3 colours - Tan, Oxblood or Black. African Buffalo fullgrain leather with real scars and scratches.